As some of you may already know, I have decided that 2014 is going to be the year of better skincare. Makeup has dominated my beauty regime for the past decade or so and now I'm in my mid twenties, I really do feel it's perhaps about time to start focusing a little more on caring for my skin. We all have varying skin care needs and sometimes it can be difficult to work out what products will suit our skin and often it's simply a case of trial and error. My own skin type can be difficult to manage at times. It's quite prone to developing oiliness around the T-Zone area but it can often feel dry and tight, especially after cleansing. Sometimes I develop patches of dry and rough skin on my cheeks too. I often find it tempting to avoid rich moisturizers altogether in case they clog up my skin and break me out. But if I don't give my skin the hydration it needs, I've found that my skin usually becomes even dryer in the dry areas and even oilier in the oilier areas!#bizarre! 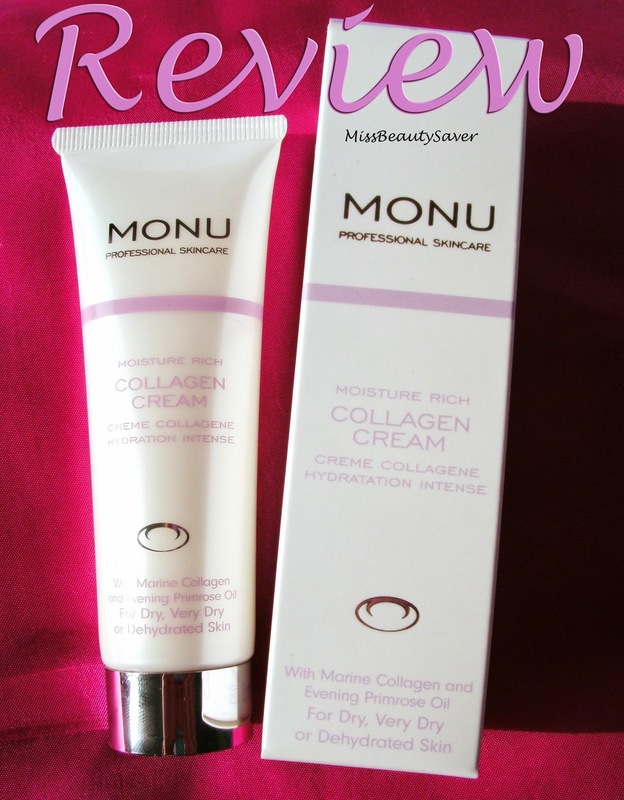 This Moisture Rich Collagen Cream from MONU is for dry to very dry or dehydrated skin. Although this isn't specifically designed for oily / combination skin types like my own, it actually works wonderfully well for my skin, quickly repairing any stubborn patches of dry skin and leaving my skin thoroughly hydrated without feeling greasy. I have been using this moisturizer both day and night for several weeks now and I've really been enjoying it a lot. I've noticed an improvement in the fine lines on my forehead which I am quite prone to and my skin does look plumper and smoother but I think a lot of my current lines and wrinkles are more due to dehydrated skin from a lack of adequate water intake rather than actual aging. I don't currently have any heavy duty lines or wrinkles to test out the full impact of it's collagen boosting properties but from my experience, I do think that this effectively helps to soften the look of lines and wrinkles because it is so intensely moisturizing and hydrating. The fact that it contains collagen can only be a good thing for all round skin rejuvenation and I would also dare say that this ingredient in particular would be especially beneficial for aging skin. This cream absorbs quickly and makes a good base for makeup application yet it is still luxurious enough to provide lasting hydration and it can double up as a night time moisturizer too. It does feel luxurious and the 50ml size means there is enough here to last a good few months which is great because it is more of an investment product for girls on a budget. Contains: Rose & Geranium essential oils, Evening Primrose & Blackcurrant Seed Oils, Shea Butter & Sodium Hyaluronate and Marine Collagen. MONU products aren't tested on animals. This collagen cream is the first product from MONU that I have ever tried and I think that this is one of the best facial moisturizers I have ever used as it provides some instant and visible skin boosting results. It also contains a lot of high quality natural and scientific ingredients that should help maintain healthier skin in the longer term. This product has now got me very curious about the rest of the extensive MONU skincare range...! Have you ever tried anything from MONU before?